I'd say the ZM is likely (but not certain) to suffer the same problem as most other wide-angles designed for rangefinders - smearing on the edges on the a7 (and other full-frame sensors). I had a bag full of Leica wides, which I had hoped to use with the a7R, but most were deeply disappointing (except the WATE). Sold them all. A nice thought but I would say not optically. The CV35/f1.2 Mk1 predated the Leica M8 (First digital M mount camera) by a number of years if I remember correctly. The Mk2 came later only because Voigtlander claimed that the Mk1 was to costly to manufacture. The optical design number of elements and grouping are the same formula for both the Mk1 and Mk2 with the exception of improved glass. I don't disagree that the Mk2 focuses closer at 0.5m but that is exactly what the Zeiss Ikon rangefinder film camera focused down to. As I said earlier Mike this is a whole new design ZM lens that has been designed with digital sensors in mind and not film only. I'm sure the new ZM will be a cracker and my previous comment was not intended to rain on anyone's parade, but to suggest a possible explanation for the lack of discussion on this lens. Its kinda caught between the CV 35 f1.2 II and the Leica 35mm FLE. It may turn out to be the best of the bunch in some respects, but people already have options. I would say the relatively lacklustre reception of the 35 and 50mm Loxia lenses has the same explanation: we have 35mm and 55mm FE lenses already and both are strong performers. 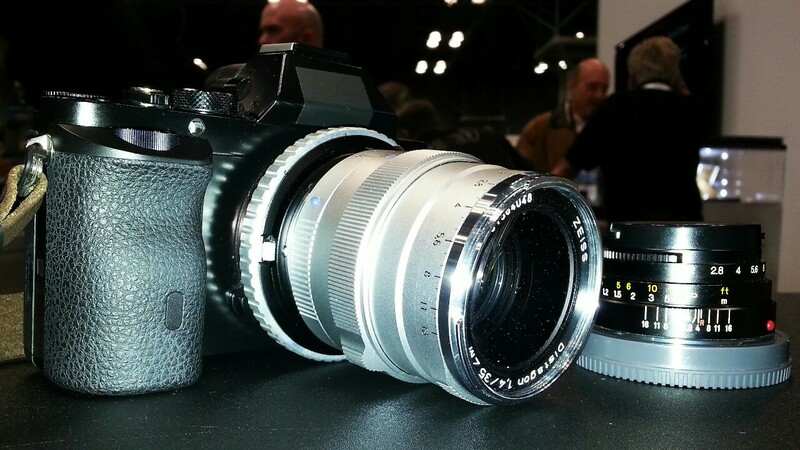 Had Zeiss released 18, 21 and 25mm Loxias, it would have been very different! I too will be interested to see how the new ZM performs on the Sony FE cameras. The Loxia focal lengths are even more surprising now that the FE 35/1.4 was announced too. We have three 35 mm primes from companies supposedly working close together but no prime below 28 mm (I'm not counting the 28 + converters as such, they may be ok, but I'm a A7R using pixel peeper) or 85/135 even on horizon for 2015. I love true manual focus Zeisses and had the Makro Planar 50 before my FE 55/1.8 but since I now have both FE 55/1.8 and FE 35/2.8 I'm not interested in 1st Loxias at all. If one of them was <= 24 mm I already would have preordered. I'm in the fence between the 35/1.4 and the Loxia 35/2 myself. What I do know is that my 35/2.8 is about to be gone. I just never loved it although I think it's competent. Everyone would like the little A7 battery to last longer. Maybe a better one will come along. Spoiled kids with their 36 exposures. Try shooting weddings on 120. 12 shots. However, we had a couple of pre-loaded film backs ready in a hip bag, so it wasn't too bad. Plus, I tended to use 220 for 24 shots per back. Hell back in the day when I had a back to support it I had 3 film cameras i traveled the globe with. Back in the day I had an old Kodak 110 and a Vivitar 35mm cameras that my parents got me and my sister for Christmas... Never knew it would lead to this borderline expensive hobby. Apparently the Sony FE 35mm f/1.4 is larger than the 16-35 f/4. I do not believe Sony is on the right track. Check FM forums for size description by Jman aka admiring light. Given how we don't have the actual specs from the production version Sony 35 f/1.4, and only have photographs and a small handful of observer impressions, isn't it a bit premature to assume Sony is on the right/wrong track? As it stands though, the Sony 16-35 is 2 ounces lighter and 1/2 inch shorter than the Canon 35mm f/1.4. I am not sure about the source of your info but the Sony 16-35 is a bit longer but same width as the Canon 35 1.4 L. This is from Canon USA and BHphoto (sony does not list this lens). If the Sony 35mm is larger than 16-35 then it should be larger than both Canon and Nikon counterparts. This negates the mirrorless advantage in size. Also consider ergonomics, mounting a huge heavy lens on a small camera....well let's hope I am wrong. Never knew it would lead to this borderline expensive hobby. Borderline, huh? Man, you're just not trying hard enough! Sony may be smarter than we are giving them credit. When they launched the A7 and A7R, they expected the A7 to heavily outsell the A7R, as most people dont need 36 MP, but the sales figures were the opposite: the A7R heavily outsold the A7. The A7R is the cheapest way to get your hands on 36 MP and you can put lots of old lenses on it. Is everyone really buying the A7R because they want a small camera or because they want 36MP, lots of lens options and a low price? If the latter, then some large lenses that realise that resolution is quite sensible. Its not what I want, but I wonder if they have realised how 'megapixel and resolution' obsessed the market actually is. Mostly bought it to replace my Nikon D800e so squarely it was a 36mpx decision plus focus peaking, live view than size. But the A7r was my answer for sure. I actually sold the A7 and looking back at it having the A77II to replace it was a good decision. But I use the A77II for very specific speed reasons both AF and fast shooting. I dedicated a Sigma 18-35 1.8 to it and use my 85 and 135 A mounts for it as well. The A7r is actually harder to buy lenses for in a way. I'm looking for more look and functionality, speed is not a issue. I have the Canon 17 TSE that I love but after that I'm still in limbo. I have A Sigma 35 Art 1.4 that I'm going to sell and either get the 16-35 or new Zeiss 35f2. I'm leaning towards the zoom but I still want the 24TSE to add to things. On the 50 front not sure what the hell I want. The 55 1.8 is awesome but it has no real look to it, so I may get the new Zeiss 50mm. My big issue right now is money with a grandson coming in a few weeks than putting on a wedding for my daughter it's just a little hard to spend money on gear. These are 2 lifetime events that I may not be around for later down the road. So I'm thinking the 16-35 solves a few issues and covers a range for me. I actually preordered the 16-35 now just need to sell the 35 and raise some more cash. Honestly anything under the 85 weight and size are really not the biggest issue except the Sigma 35 its a truck. But it's the 85 and mostly the 135 as good as they are they are big. I keep it in check and once I moved from Leica things got a bit easier to manage. Without banging the gong too many times...It sounds as if the ZM 35mm F1.4 Distagon is promising for A7R (High Res Sony sensors)...As said before at 381g + adapter makes this a pretty lightweight solution. I will wait for the more serious test before raising my hope about ZM. It would be good to know what the development lead time was for the ZM 35/1.4, as Zeiss have been working on the Loxias since the announcement of the a7 series. Did they factor in what changes would be needed for an enhanced Loxia version, improved for a7r performance? My guess is they did and will keep that one up their sleeve and see how Sony's FE counterpart does in the marketplace. They would be keen to see the two lines as quite separate, and the MTF for the Loxia 35/2 looks more like a different lens than a slightly revised (altered exit pupil placement) ZM 35/2. Apart from Leicaphile cafe reviews like the one over at Steve's place, the Loxia 35/2 will raise more than a few eyebrows as a general purpose lens, as it is great at f5.6. Zeiss are not noted for restricting lenses to near distance work, and it is designed for the a7r after all, hardly a street shooter. I have to imagine this guy never met the RX1 or either the ZE/F or CY f1.4 Distagon either: 'No 2/35mm renders a spectacular bokeh'. While I am excited to see Zeiss developing new fast lens formulations, your right Philip, it is going to be extremely difficult for them to surpass the wonderful C/Y 35mm f/1.4 Distagon. Save for the OTUS line, which have a look all of their own, I don't like the look from any of the newer Canon or Nikon Distagon focal lengths as well as I like my older adapted C/Y lenses. Re: ZM 35mm F1.4 Distagon - More Gong banging from me, so apologies to those who are less interested than myself. I know it remains still to be seen how it performs on the A7R etc. It looks to be the new King of 35mm's on the M240 reading Diglloyd. Diglloyd Quote: "I had to send the ZM 35/1.4 Distagon back to Zeiss, but I was loathe to do so: I consider it the most enjoyable lens I’ve yet shot on Leica M; it pulls together so many attributes so well, both optically and operationally. It is unequivocally the star of the ZM lineup. In terms of operational excellence, I rank it above all my Leica M lenses. I greatly prefer its physical characteristics over the Leica M 35m Summilux and Summicron, which feel awkward to my hands by comparison. Stunning on the Leica M240, the pity is that when stopped down slightly, the M240 sensor is the weak link. I have no hesitation in selling my Leica 35mm Summilux, a task no doubt made harder by this post"
diglloyd: Zeiss ZM 35mm f/1.4 Distagon for Leica M: Best 35mm M Lens Yet? This new Zeiss 35 makes me pause as I was just about to pull the trigger on the Leica 35 Summilux.... Not to mention if I went this route, I would still have a good amount of $$$ in my pocket. Like a lot of us, I love the older lenses greatly...but man, are Zeiss moving the goalposts these days! Thanks for the links, Barry. Chuck, I try not to think about that one that got away (from me anyway) - the Contax 35/1.4, apparently they are hard to find in good condition these days. What a three lens set CZ had in that range: 21/2.8 - 35/1.4 and 100/2 (very underrated). It is hard to believe they are keeping each of ZE/ZF users (Otus); Sony users (Loxia) and Leica users (ZM) happy. Zeiss has sure done a lot of things right listening to their clients. Across the entire spectrum, their optics are ranked right at the top. From contact lenses to camera lenses, the brand Zeiss means high quality. I was never able to get the "edges" covered with the 35mm Zeiss before the prices started getting up and out of sight. I never had the 21/2.8 as it has been insanely priced for years. I think either Guy or Jack had one of those I almost bought but never could afford. I never got the 135 f/2 either. I have covered the middle across the range though. 28mm f2, 35mm f/1.4, 50mm f/1.4 (another greatly under rated lens), and 85mm f/1.4. For my 100mm I chose to go a different direction, the 100mm f/4 Macro with the bellows vs the 100 f2. Creatively I am not sorry for the choice. It is heavy and hard to work with, more than a little unwieldy, doesn't get into my bag very often, but when it does it does great things nothing else can do. One day when I win the lottery I'll buy the rest of the Contax set as well to fill out my edges . Can you tell us how well the ZM 35/1.4 performs on the Sony A7 series cameras please? Especially the A7r. As you know due to cover glass and exit pupil distance many wide angle RF lenses have poor corner performance, both colour cast and smearing." ZEISS ZM lenses are designed to be used with analog and digital M-mount rangefinder cameras. That's why they include special design features which have been developed to ensure optimum image quality with these camera systems. It is, however, possible to adapt ZM lenses. Nevertheless, the specific design of ZM lenses may cause some limitations in operation and image quality if they are adapted to mirrorless system cameras." Apparently Digilloyd isn't impressedwith the ZM 35/1.4 on the A7 but I am not a subscriber to read his views. Just saw the mention on SAR. The fact that Zeiss was developing this lens does bum me out about the Loxia in that they based it off the ZM 35/2 Biogon and not this ZM 35/1.4 Distagon as I would've paid the $2000 entry price for a potentially great fast 35 with mechanical focus. Well there's still the big one coming in March so we will see how that one fares optically. Remember this folks even though in a A mount not much will come close and I have not seen it yet but the Sigma Art 1.4 is outstanding and rated extremely high resolving power. Its big, its heavy but I have yet to see anything beat it. And its cheap. Besides its hedging your bets that the next Sony monster Mpx just might be in a A mount. I have 3 A mount lenses and there some of the best around. ZA 85 and ZA 135. Until I see a true replacement the 85 and 135 are in the bag. I was just eyebanging the 135/1.8 again a few days ago... Been talking myself out of it for 2 years now but I may pull the trigger on it. I have a Zeiss Contax 85/1.4 and it's really good although there's no AF. The 135/1.8 is simply the best. I hope and pray that Sony pays homage to it with an FE version. I'd be happy with a slightly smaller Zeiss f/2 with that same Sonnar rendering. I owned the 135 f/1.8 with an A77 and loved the lens for still photography. For video though, it was WAY too noisy for me. That internal motor sounded like a sausage grinder spinning up ... not to mention it is almost the size of a grinder as well. Ok, so Guy when do we see the review of the 16-35? I will wait for your verdict before taking the plunge. Yeah, Guy, doesn't Sony supply you with an advance copy for evaluation? I said the same thing about the Leica Summicron 90 Pre-AA. It has a long (270 degree-ish) throw but it is an excellent portrait lens but sharpens up to "clinical" levels by f/4.5 or so. I greatly prefer it to the 90 Cron AA in that capacity hence why I bought it instead. Got to agree with you on this one. That Leica 90mm 'Cron ASPH is too sharp for portraits. Looks too "clinical" even wide open, and women especially hate it. I use an older than dirt 90 Elmarit instead. The Elmarits are great too but whenI got my Summicron like new it was going for the same price as the latest Elmarit. I figured for portraits it was okay to focus slower plus I could always open it up. As for women not liking the aging that some lenses show - well I say that's just wisdom, experience, and possibly great stories to tell. I'd think the pre-ASPH 'Cron would be a great lens too, and having the edge for speed does help at times. My old Elmarit is a 1957 vintage, so can be too soft for some things, so is perfect for female portraits. My wife is fine with the wisdom, experience, and great stories to tell reasoning. However, let me use too sharp of lens I can guarantee she will hate the photo. It is a visceral reaction, nothing to do with reason or logic...LOL! Yup... I would guess you catch side eyes and cold looks from the opposite gender all day long for stirring that pot... I think I had it "right." No one ever accused me of being a slow learner. Men look at women, women see themselves being looked at, in mainstream societies anyway. They spend a huge amount of time looking at other women too, in print, movies, on the street. It is good to see the portrayal of women is shifting these days - you see in movies much more interesting female leads, strong women with actual skin, not that rubbery plastic business so beloved of magazines and the PS smoothers. Homeland, Dexter, Gone Girl, Zero Dark Thirty, the Danish cop series The Killing come to mind. Like most of us I love character most of all, and the faces that show it. The tide is turning! That very true. I spend a lot of time allover the world. It's very cool to see magazines from different places and what they define as the image of "beauty" internationally. Many times it is quite different from the typical portrait of the "midwest girl next door" your typically see in America.